An in-depth piece of reporting by Alex Shirazi (a pseudonym of an Iranian dissident) in The Daily Beast examined the financial windfall key members of the Iran lobby are due to inherit through passage of the nuclear agreement with the Iran regime; specifically the involvement of an Iranian family called the Namazis which played a key role in the creation of the National Iranian American Council, the lead lobbying force for the regime. Shirazi examines the family’s history coming out the Iranian revolution and the opportunity it saw to turn a thawing in relations between the U.S. and the Iran regime into serious business opportunities, including Pari Namazi and her husband, Bijan Khajehpour, who returned to Tehran in 1993 to launch a company called Atieh Bahar Counsulting, offering services to foreign companies interested in doing business in Iran. That company provided a pipeline of communication directly into the leadership of the regime and after more family members joined the enterprise, Atieh’s client list rapidly grew to include global brands such as “German engineering giant Siemens; major oil companies BP, Statoil, and Shell; car companies Toyota, BMW, Daimler, Chrysler, and Honda; telecom giants MTN, Nokia, Alcatel; and international banks such as HSBC,” according to Shirazi. But that success was marred by their close relationship with leaders of regime who were revealed to be hip deep in corruption schemes including Mehdi Hashemi, the son of then regime president Hashemi Rafsanjani, who was later imprisoned on bribery charges. Coupled with revelations that the regime was in violation of the Nuclear Non-Proliferation Treaty in 2002 by disclosures from the National Council of Resistance of Iran, a leading Iranian dissident group, the Namazis’ saw their fortunes wan until Bijan Khajehpour began a relationship with Hassan Rouhani who would later be the handpicked president and sold to the world as the “moderate” face of the Iran regime. End “the taboo of working for a new approach on Iran”—i.e., end the then-two-decade-old U.S. policy of containment. Soon after the NIAC was created which Parsi heads and gave birth to an official lobbying arm, NIAC Action, both of which led the vanguard action pushing for the Iran nuclear deal. Most interestingly, Shirazi describes how while serving as president of NIAC, Parsi wrote intelligence briefings as an “affiliate analyst in Washington, D.C.” for Atieh, focusing on such topics as whether or not the American Israel Public Affairs Committee (AIPAC) would revive its anti-Iran campaigning on the eve of the Iraq war, or on the efforts by the Mujahideen-e Khalq (MeK), an Iranian opposition group to oppose the regime. 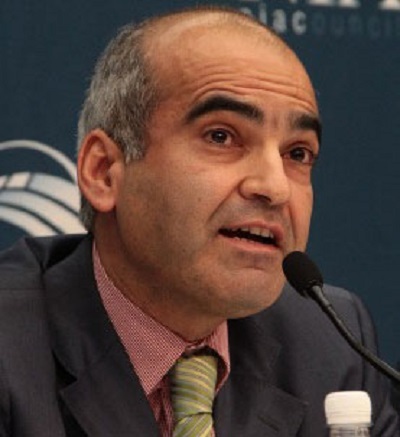 Parsi became a strong booster of Khajehpour to American media while being paid by for his work and not disclosing that financial arrangement with Atieh. With almost half a million Iranian Americans living in the U.S., NIAC only boasts 5,000 dues paying members, but claims a vast network of supporters for the regime’s causes. NIAC has also served as a proving ground for staffers who are funneled into U.S. government positions and other non-governmental organizations supportive of the regime. Shirazi describes the background of Reza Marashi, who works for NIAC after coming to from a stint at Atieh and with the U.S. State Department as an Iran desk officer, a similar position that has other NIAC staffers, most notably Sahar Nowrouzzadeh who is now National Security Council director for Iran in the Obama administration and therefore the top U.S. official for Iran policy, have occupied. Interestingly enough, Nowrouzzadeh does not list her employment as NIAC and Marashi refuses to acknowledge his time at Atieh. Shirazi points out, as we did on this blog previously, how Parsi and the NIAC public and social media statements have hardly mentioned any criticism of regime policy, nor condemned the most notorious actions of the regime such as the three proxy wars in Syria, Iraq and Yemen it is fighting, nor the continued imprisonment of Iranian Americans such as Amir Hekmati and Saeed Abedini. What the NIAC does focus on specifically is the lifting of sanctions against the regime and opposing any efforts within and outside the U.S. government to support regime change within Iran, both of which would have serious consequences on the prospects of the Namazi family. Shirazi also recounts the failure of Parsi’s defamation lawsuit in 2008 against Hassan Dai, an Iranian exile working as an investigative journalist with the Voice of America. That lawsuit revealed a trove of documents substantiating much of the relationship Parsi and NIAC had with the regime leadership. The reach and ambition of the NIAC was revealed this week by Fox News’ Ed Henry who disclosed that emails released from Hillary Clinton’s personal server included a request from former president Bill Clinton to State Department staff about the possibility of delivering a paid speech to a gathering hosted by NIAC. President Clinton eventually declined the speech, but the incident demonstrated Parsi’s desire to push into the highest levels of American policy making.